With summer coming up, it’s time to start working on lighter options. 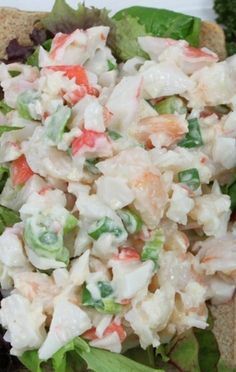 Seafood salad with crab and shrimp is an easy fix up that will feed you for a few days. I use canned crab meat and chilis because it’s faster an easier, but you can substitute out with fresh. With this, you can make some great cold sandwiches and lettuce wraps. Drain out the Green Chilis and Crab Meat cans. Finely chop up Shrimp, Onions, Peppers, Celery. Mince Garlic. In large bowl, combine all ingredients, EXCEPT the Crab and Shrimp, and mix well. Fold in the Shrimp first and then the Crab Meat. This keeps the meat chunkier. This will stay good for about a week in the fridge. Wrap up in a lettuce leaf or on a toasted roll and enjoy!